"What We Left Behind," a proposed new documentary, would look back at the creation and influence of "Star Trek: Deep Space Nine." A new documentary aims to celebrate what the filmmakers call an underappreciated series in an iconic franchise. When "Deep Space Nine" debuted in January 1993, loyal "Star Trek" fans found a darker world than the hopeful earlier installations of the long-lasting franchise. What We Left Behind Indiegogo Pitch from 455 Films on Vimeo. "'Deep Space Nine' was written off as too 'dark,' 'edgy' and 'the black sheep' of the 'Star Trek' family, a show that did not fit Roddenberry's vision of the future," the documentary's creators wrote on the Indiegogo page. "But someone was still watching, as the show lasted seven seasons." "Now, over 20 years later, fans all over the world are rediscovering 'Deep Space Nine' and embracing the show with an enthusiasm rivaling the affection they feel for any other 'Star Trek' series," they added. "Critics are even calling the show the jewel in the crown, and the best of the 'Star Trek' franchise. A devoted sci-fi fan might rightly ask themselves: 'What the hell happened?'" The documentary is produced by 455 Films and is directed by Adam Nimoy, son of "Star Trek" actor Leonard Nimoy, who played the beloved alien Spock in the original series. Adam Nimoy and the production company were also behind "For the Love of Spock," a 2016 documentary that celebrated Leonard Nimoy's fan legacy and relationship with his family. The "Deep Space Nine" documentary is spearheaded by Ira Steven Behr, producer and showrunner of the series, and features many of the original cast members. Some of the actors in the new documentary include Nana Visitor (Kira), Terry Farrell (Dax), Rene Auberjonois (Odo), Armin Shimerman (Quark) and Alexander Siddig (Dr. Bashir). Veterans of "The Next Generation" and "Deep Space Nine" also are involved, including Colm Meaney (Miles O'Brien) and Michael Dorn (Worf). The documentary has already blasted through several revised crowdfunding goals for the filmmakers to add content to the finished film. At $250,000, the film was extended from 60 to 90 minutes, and more 3D graphics and animation were promised. 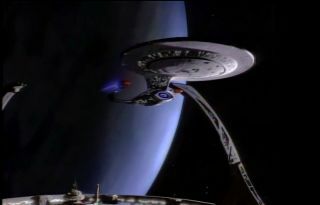 At $350,000, the film's creators committed to an original score with a live orchestra, and at $425,000, more round-table interviews with "Deep Space Nine" crewmembers were promised. There is an additional stretch goal of $500,000 that would upgrade some of the show's clips to high definition. "The bulk of the money we raise will be going into the key elements of what it takes to make a film like this one," the creators said. "We have been actively filming interviews over the past few years with many of the people involved in the series, so a good part of production is already complete ... but our work is far from done." "As we hone the story with Ira and the team, there are still some important key interviews we will need to capture with creatives and talent situated in various places around the globe," they added. "Your contributions can help to make that, and the rest of the process, happen." You can contribute to the project ;on the film's Indiegogo page.